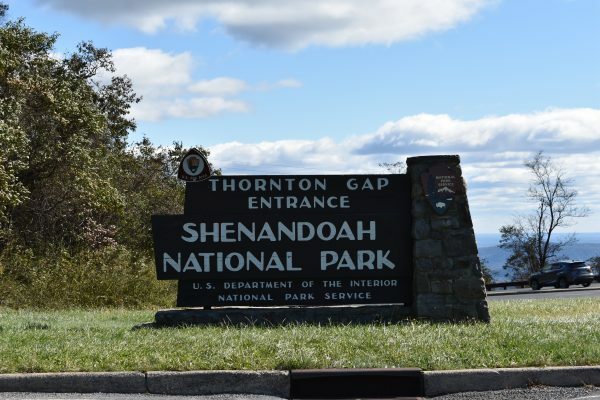 We visited Shenandoah National Park in Virginia on a recent trip to Washington, DC. Having lived out west all of our lives, we were surprised by some of the history of this park, but we still found it very beautiful, particularly during the Fall. After the creation of Yellowstone and Yosemite and other parks out west, politicians got excited and decided to create a national park in the east. 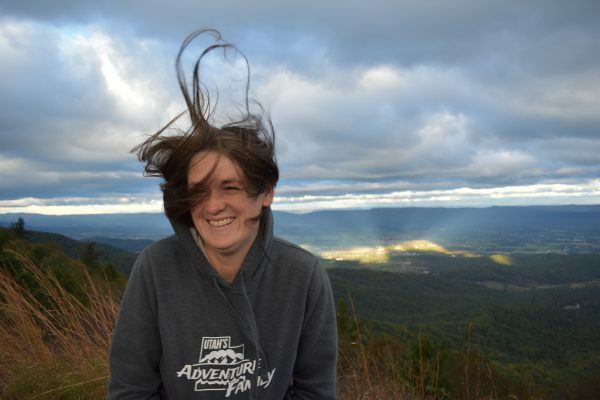 Several locations were looked at, but the Skyline Drive of the Blue Ridge Mountains was finally chosen. The problem was, many farmers already owned the land. 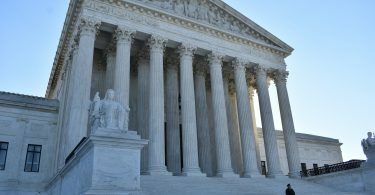 The government commissioned a report that found the local population “inbred” and “failing” so the land was condemned and the owners were removed from their property. 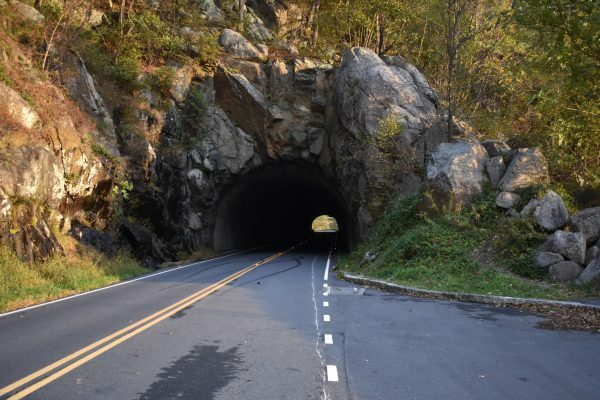 This opened the way for Shenandoah National Park in 1935. We learned a lot of this history in the Byrd Visitor Center. There was a very interesting display, and a great movie that provided information about Shenandoah. 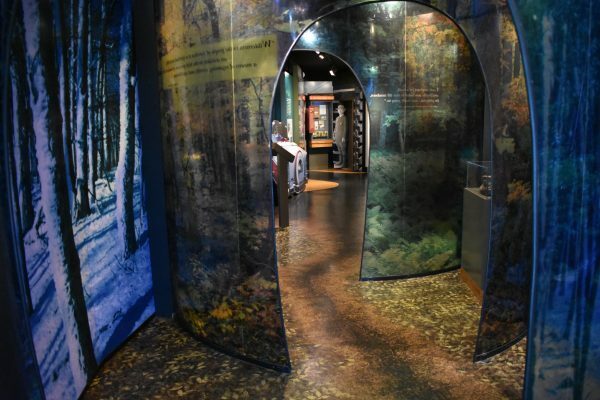 We loved the displays in the Byrd Visitor Center. 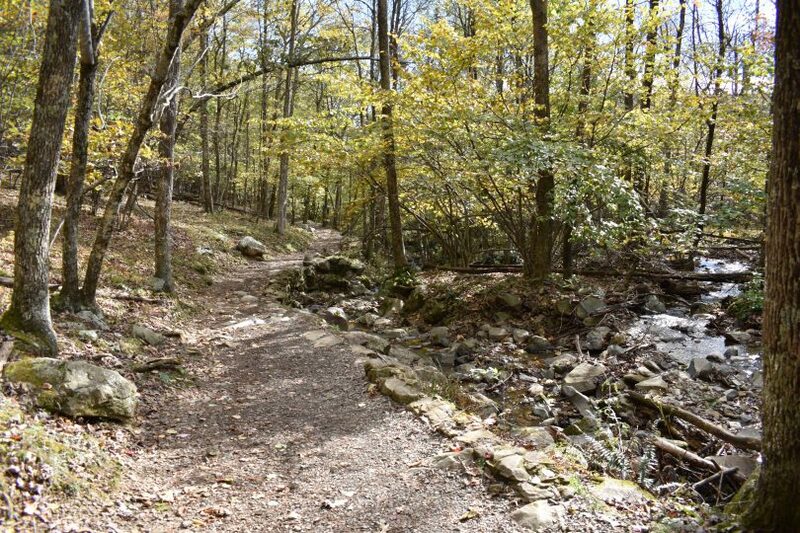 Despite its early history, Shenandoah is a great park today. The main feature is the drive along the skyline of the mountains. One thing we had to remember is that elevation is relative. With our hometown at 4,564 ft, we snickered at the highest point in Shenandoah, which is Hawksbill peak at around 4,050 feet. The skyline of Shenandoah is nothing like a skyline in Utah. 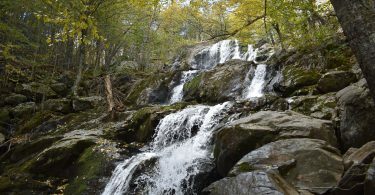 Still, there are beautiful waterfalls, white tailed deer, and other animals to see. 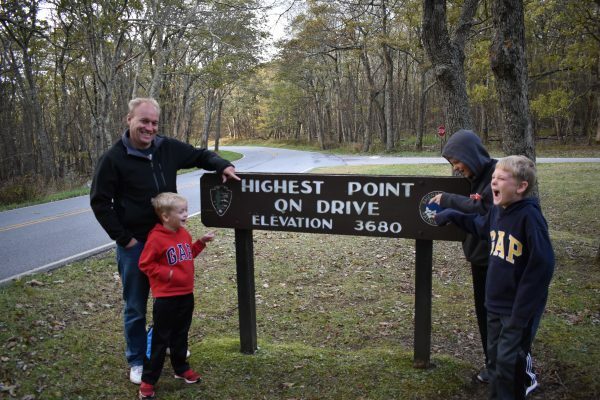 We did chuckle at the highest point on Skyline Drive. Our home sits about 2,000 feet higher than this in Utah. 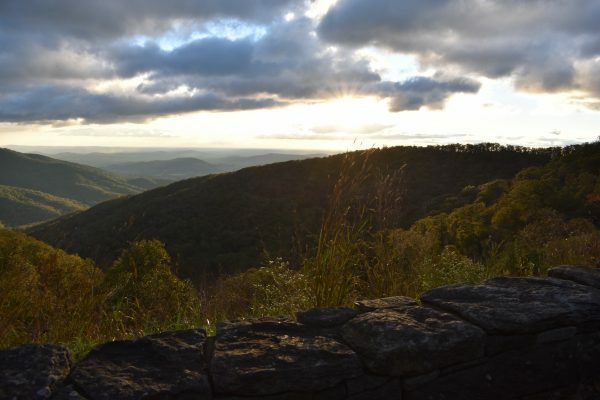 The park has divided the Skyline Drive into sections, as well as marked locations of hikes and visitor centers with mile markers. There are tons of pull outs with views of the valley, too. The drive from one end of the park to the other takes about 3-4 hours because the speed limit is 35 mph and there are few places for passing. So plan your visit accordingly. 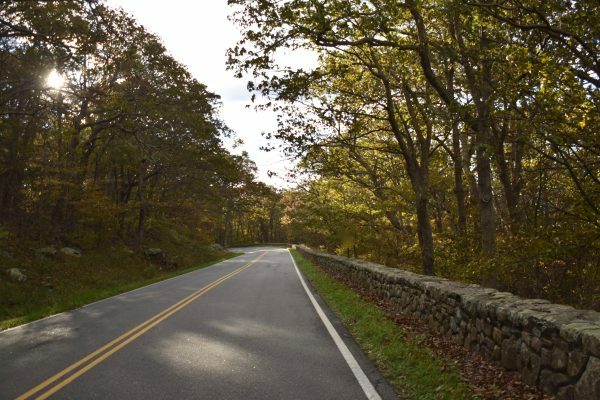 Here is information about Skyline Drive from the NPS website. We only drove Skyline Drive for about an hour, but it was beautiful. Fall was just arriving in Shenandoah even though it was already October 20. We enjoyed the rock walls along the road, and the trees draping over the van as we drove through. I’m sure this road looks much different in Spring and Summer. Skyline Drive is gorgeous all by itself. There are so many great pull outs with amazing views. The day we arrived it was chilly and windy, and had even snowed a little the night before. We are used to that type of weather, but we had traveled from Utah without coats and hats, so we were ill prepared. So we had to cut our visit short with limited hiking and exploring. The wind was intense up on top of Skyline Drive, but we still enjoyed the views. 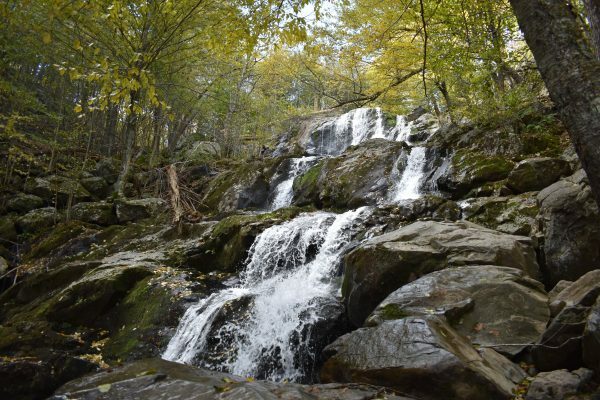 Dark Hollow Falls was a beautiful hike and we highly recommend it! 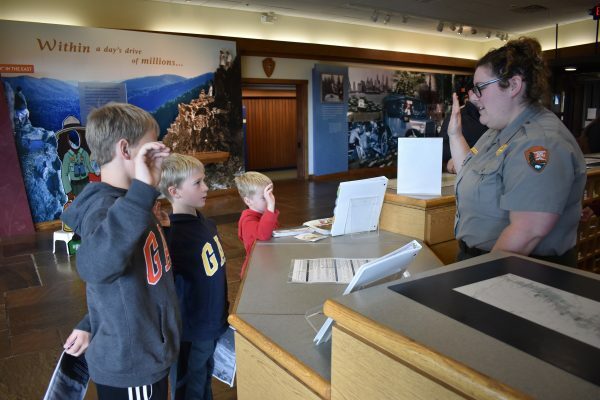 One of our favorite things to do in National Parks is have our children participate in the Junior Ranger program. We as parents learn along with our kids as we help them complete the booklet. We recommend printing the booklets beforehand so you can get a head start on the work, and then complete them in the park. If not, you can always pick up a booklet at the Visitor Center. This program is free at Shenandoah. We love how kind Park Rangers are to our little Junior Rangers. 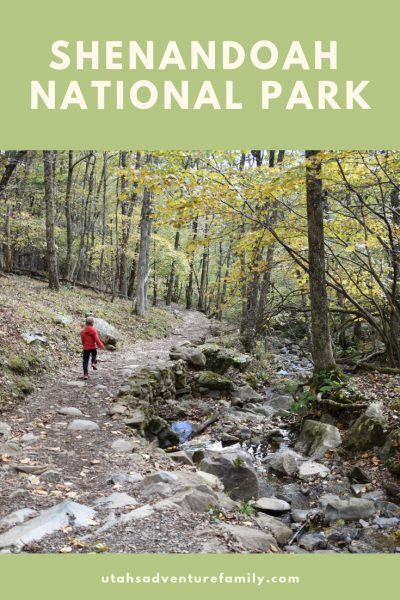 If you’re looking for a bit of an escape on the East Coast, Shenandoah National Park gets you away from the crowds and into the outdoors. We loved exploring this beautiful area of Virginia.